The following are some of the test patters I use in classes. You can download the uncompressed HD tiff files for free. The original files are UHD uncompressed and are available by file transfer for £20 (with 3 bonus tests otherwise only available in my new classes). The page images are low res jpg, so you will need to use the download links below. This file has a digital Macbeth surrounded by black and white Pluge patterns and a simple identifier to show full range or video signals. It also has patches showing full range, video and log black and white points. Perfect for checking monitor brightness and contrast without a probe. This file contains an image in four versions, ACES, BT.709, DCI P3 and HDR PQ BT2020. The original images are available from Acescentral.com where you can get the ACES image as an .exr. 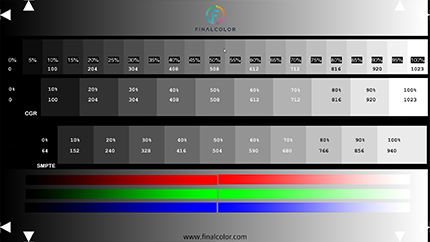 This is not an ACES image but this frame is an easy way to tell what colourspace you are monitoring. Display the frame and look to see which of the 4 patches looks correct on your monitor. Then take into account everything in the path from the player to the screen, e.g. graphics or video cards and LUT boxes. These are the most common master formats. This image contains the infamous Marcie, Kodak LAD frame in its original Cineon log with an ACES copy (originals from Kodak and Academy ACES). Together with a 21 step grayscale this is a good reference image to check monitoring setups. 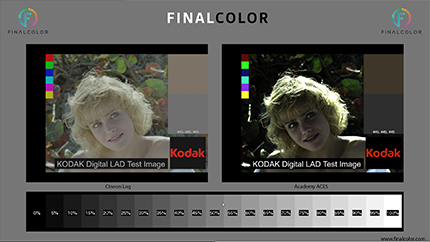 The Cineon Log Marcie can be used to evaluate LUTs. Please note that the ACES Marcie is limited by the Tiff format and will appear correct but clipped to film print values in an ACES workflow . Use the original Academy ACES .exr file for testing full range ACES pipelines.